Johann Sebastian Bach (March 21, 1685 – July 28, 1750) was a prolific and versatile German composer and organist of the Baroque era, whose sacred and secular works for choir, orchestra and keyboard drew together almost all of the strands of the Baroque style and brought this musical form to its ultimate maturity. Bach composed for every musical category of his time except for the genre of opera, and expanded musical composition in format, quality, and technical exactness through elevated harmonizations, fugues, and intricate melodies. Ultimately, Bach's sole aim was to glorify God, as the designation "Soli Deo Gloria" (“To God Alone the Glory”) was signed on many of his compositions. For Baroque era composers, music was not primarily an exercise in compositional technique but rather had deep spiritual and religious underpinnings. Bach expressed as much, writing, "The purpose and end aim of figured-bass is nothing more than to praise and glorify God. Where this is not the case there can only be infernal scraping and bawling." Bach was influenced greatly by Martin Luther's assertion that music was, "a gift from God, not a human gift." Luther's concept of music being a form of praise to the Almighty, "a sermon in sound," could be Bach's personal credo with regard to his art. Although he introduced no new musical forms, he expanded and enriched the prevailing German style with a robust and dazzling contrapuntal technique, a seemingly effortless control of harmonic and motivic organization from the smallest to the largest scales, and the adaptation of rhythms and textures from abroad, particularly from Italy and France. His forceful suavity and vast output have earned him wide acknowledgment as one of the greatest composers in the Western tonal tradition. Revered for their intellectual depth, technical command and artistic beauty, his works include the Brandenburg concertos, the keyboard suites and partitas, the Mass in B Minor, the St. Matthew Passion, The Musical Offering, The Art of Fugue and about 240 church cantatas. Bach was a member of one of the most extraordinary musical families of all time. For more than two hundred years, the Bach family had produced dozens of worthy performers and composers during a period in which the church, local government and the aristocracy provided significant support for professional music-making in the German-speaking world, particularly in the eastern electorates of Thuringia and Saxony. 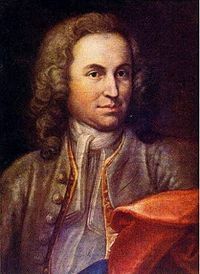 Sebastian's father, Johann Ambrosius Bach, was the popular town trumpeter and director of musicians in Eisenach, a Thuringian town of some six thousand residents. The post involved the organization of secular music and participation in church music. Sebastian's uncles were all professional musicians, ranging from church organists and court chamber musicians to composers. His mother died in 1694, and his father the following year. The ten-year-old orphan moved in with his elder brother, Johann Christoph Bach, the organist at Ohrdruf, a nearby town. There, he copied, studied and performed music, apparently receiving valuable tuition from his brother. This probably exposed him to the work of the great South German composers of the day—such as Johann Pachelbel and Johann Jakob Froberger—and possibly the music of North German and French composers such as Jean-Baptiste Lully, Louis Marchand and Marin Marais. The boy probably witnessed and assisted the maintenance of the organ, a precursor to his lifelong professional activity as a consultant in the building and restoration of organs. At the age of 14, Bach was awarded a choral scholarship, with his older school-friend, Georg Erdmann, to study at the prestigious St. Michael’s School in Lüneburg, not far from Hamburg, the largest city in Germany. This involved a long journey with his friend, probably partly on foot and partly by coach. His two years there appear to have been critical in exposing him to a wider palette of European culture than he would have experienced in Thuringia. In addition to singing a cappella in the choir, it is likely that he played the school’s three-manual organ and harpsichords. He probably learned French and Italian, and received a thorough grounding in theology, Latin, history, geography and physics. He would have come into contact with sons of noblemen from northern Germany sent to the highly-selective school to prepare for careers in diplomacy, government and the military. It is likely that he had significant contact with organist-composers in Lüneburg, in particular Georg Böhm, and visited several of those in Hamburg, such as Johann Adam Reincken and Nicholas Bruhns. Through these musicians, he most likely gained access to the largest instruments he had ever played. It is also probable that he became acquainted with the music of the North German tradition (in particular the work of Dietrich Buxtehude, with music manuscripts from further afield, and treatises on music theory that were in the possession of these men. Shortly after graduating, Bach took up a post as a court musician on or about January 1703 in the chapel of Duke Johann Ernst in Weimar, a large town in Thuringia. His role there is unclear, but appears to have included menial, non-musical duties. During his seven-month tenure at Weimar, his reputation as a keyboardist spread. He was invited to inspect and give the inaugural recital on the new organ at St. Boniface’s Church in Arnstadt. The Bach family had close connections with this oldest town in Thuringia, about 120 miles to the southwest of Weimar at the edge of the great forest. In August 1703, he accepted the post of organist at that church, with light duties, a relatively generous salary, and a new organ free of technical defects and tuned to a modern system that allowed a wide range of keys to be used. It was around the time of his Arnstadt appointment that Bach embarked on the serious composition of organ preludes, among them the famous Toccata and Fugue in D minor. These works, in the North German tradition of virtuosic, improvisatory preludes, already showed remarkably tight motivic control (where a single, short music idea is explored cogently throughout a movement). However, in these works the composer was still grappling with issues of large-scale structure, and had yet to fully develop his powers of contrapuntal writing (where two or more melodies interact simultaneously). Strong family connections and a musically enthusiastic employer failed to prevent tension between the headstrong, precocious young organist and the authorities after several years in the post. He was apparently dissatisfied with the standard of singers in the choir. More seriously, there was his unauthorized absence from Arnstadt for several months in 1705–1706, when he visited the great master Buxtehude in the northern city of Lübeck. This well-known incident in Bach’s life involved his walking some 400 kilometers (248 miles) each way to spend time with the man he probably regarded as the father-figure of German organists. The trip reinforced Buxtehude's style as a foundation for Bach’s earlier works, and the fact that he overstayed his planned visit by several months suggests that his time with the old man was immensely valuable to his art. Despite his comfortable position in Arnstadt, by 1706 Bach appears to have realized that he needed to escape the family milieu and move on to further his career. He was then offered a more lucrative post as organist at St. Blasius’ in Mühlhausen, a large and important city to the north. The following year, he took up this senior post with significantly improved pay and conditions, including a good choir. Four months after arriving at Mühlhausen, he married his cousin from Arnstadt, Anna Maria. The church and city government at Mühlhausen must have been proud of their new musical director. They readily agreed to his plan for an expensive renovation of the organ at St Blasius’, and were so delighted at the elaborate, festive cantata he wrote for the inauguration of the new council in 1708—God is my King BWV 71, clearly in the style of Buxtehude—that they paid handsomely for its publication, and twice in later years had the composer return to conduct it. After barely a year at Mühlhausen, Bach left to take up a position as court organist and concert master at the ducal court in Weimar, a far cry from his earlier menial position there. The munificent salary on offer at the court and the prospect of working entirely with a large, well-funded contingent of professional musicians may have prompted the move. The family moved into an apartment which was just a five minutes’ walk from the ducal palace. In the following year, their first child was born and they were joined by Anna Barbara’s elder, unmarried sister, who remained with them to assist in the running of the household until her death in 1729. It was in Weimar that two sons were born—Wilhelm Friedemann Bach and Carl Philipp Emanuel Bach—who both went on to become important composers themselves in the ornate rococo style that superseded the baroque. Bach’s position in Weimar marked the start of a sustained period of composing keyboard and orchestral works, in which he attained the technical proficiency and confidence to extend the prevailing large-scale structures and to synthesize influences from abroad. From the music of Italians such as Antonio Vivaldi, Arcangelo Corelli and Giuseppe Torelli, he learned how to write dramatic openings and adopted their sunny dispositions, dynamic motor-rhythms and decisive harmonic schemes. Bach inducted himself into these stylistic aspects largely by transcribing for harpsichord and organ the ensemble concertos of Vivaldi; these works are still concert favorites. He may have picked up the idea of transcribing the latest fashionable Italian music from Prince Johann Ernst, one of his employers, who was a musician of professional caliber. In 1713, the duke returned from a tour of the Low Countries with a sizable collection of scores, some of them possibly transcriptions of the latest fashionable Italian music by the blind organist Jan Jacob de Graaf. He was particularly attracted to the Italian solo-tutti structure, in which one or more solo instruments alternate section-by-section with the full orchestra throughout a movement. These Italianate features can be heard in the excerpt below of the Prelude to English Suite No. 3 for harpsichord (1714). The solo-tutti alternation is achieved when the player deftly changes between the lower keyboard (of a fuller, slightly louder tone) and the upper keyboard (of a more delicate tone). In Weimar, he had the opportunity to play and compose for the organ, and to perform a varied repertoire of concert music with the duke's ensemble. A master of contrapuntal technique, Bach’s steady output of fugues began in Weimar. The largest single body of his fugal writing is The Well-Tempered Clavier. It consists of 48 preludes and fugues, one pair for each major key and relative minor key. This is a monumental work for its masterful use of counterpoint and its exploration, for the first time, of the full range of keys—and the means of expression made possible by their slight differences from each other—available to keyboardists when their instruments are tuned according to systems such as that of Andreas Werckmeister. During his tenure at Weimar, Bach started work on Orgelbüchlein, or The little organ book for his eldest son, Wilhelm Friedemann Bach. This contains traditional Lutheran chorales (hymn tunes), set in complex textures to assist the training of organists. The book illustrates two major themes in Bach’s life: his dedication to teaching, and his love of the chorale as a compositional inspiration. Sensing increasing political tensions in the ducal court of Weimar, Bach began once again to search out a more stable job that was conducive to his musical interests. Prince Leopold of Anhalt-Cöthen hired Bach to serve as his Kapellmeister (director of music). Prince Leopold, himself a musician, appreciated Bach’s talents, paid him well, and gave him considerable latitude in composing and performing; however, the prince was Calvinist and did not use elaborate music in his worship; thus, most of Bach's work from this period was secular. The Brandenburg concerti and many other instrumental works, including the Six Suites for Solo Cello, the Sonatas and Partitas for Solo Violin, and the Orchestral Suites, date from this period. 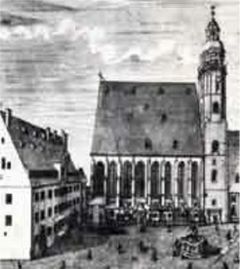 In 1723, Bach was appointed cantor and musical director of the Thomaskirche, Leipzig. This post required him to instruct the students of the St. Thomas School (Thomasschule) in singing and to provide weekly music at the two main churches in Leipzig. For the first few years of his tenure at Leipzig, Bach composed a new cantata every week through much of the year. In fact, he wrote five full cantata cycles during his first six years in Leipzig. This challenging schedule, in addition to his more menial duties at the school, produced some of his most exquisite music, most of which has been preserved. Most of the cantatas from this period expound on the Sunday readings from the Bible for the week in which they were originally performed; some were written using traditional church hymns, such as Wachet auf! Ruft uns die Stimme and Nun komm, der Heiden Heiland, as inspiration for the music. On holy days, such as Christmas, Good Friday, and Easter, Bach produced cantatas of particular brilliance, most notably the Magnificat in D for Christmas and St. Matthew Passion for Good Friday. The composer himself considered the monumental St. Matthew Passion among his greatest masterpieces. In his correspondence, he referred to it as his "Great Passion" and carefully prepared a calligraphic manuscript of the work, which required almost every available musician in Leipzig for its performance. 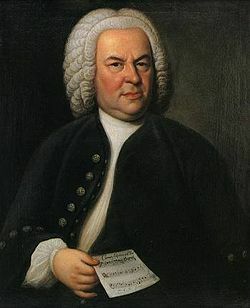 Bach's representation of the essence and message of Christianity in his religious music is considered by many to be so powerful and beautiful that in Germany he is sometimes referred to as the Fifth Evangelist. Bach's dedication to teaching is especially remarkable. It was typical for him to supervise a full-time apprentice, and there were often numerous private students studying in Bach's house, including such notables as Johann Friedrich Agricola. Bach married his second cousin, Maria Barbara Bach, on October 17, 1707 in Dornheim after receiving an inheritance of 50 gulden. They had seven children, four of whom survived to adulthood. Little is known of Maria Barbara; she died suddenly on July 7, 1720, while Bach was abroad with Prince Leopold. While at Cöthen, Bach met Anna Magdalena Wilcke, a young soprano; they married on December 3, 1721. Despite the age difference—she was 17 years his junior—the couple seem to have had a happy marriage. Together they had 13 children, which made for a total of 23 children for Bach. Five of his sons became accomplished musicians and three—Wilhelm Friedemann Bach, Johann Christian Bach, and Carl Philipp Emanuel Bach—were important composers in the rococo style that followed the baroque. Most of Bach’s manuscripts were passed on through his children, particularly Carl Philipp Emanuel and Wilhelm Friedemann Bach. At Leipzig, Sebastian seems to have maintained active relationships with several members of the faculty of the university. He enjoyed a particularly fruitful relationship with the poet, Picander. Sebastian and Anna Magdalena welcomed friends, family, and fellow musicians from all over Germany into their home. Court musicians at Dresden and Berlin, and musicians including Georg Philipp Telemann (one of C. P. E.'s godfathers) made frequent visits to Bach's house and may have kept up frequent correspondence with him. Interestingly, George Frideric Handel, who was born in the same year as Bach in Halle, only 30 miles from Leipzig, made several trips to Germany, but Bach was unable to meet him, a fact that he appears to have deeply regretted. Having spent much of the 1720s composing cantatas, Bach had assembled a sizable repertoire of church music that allowed him to continue performing impressive Sunday music programs while pursuing other musical genres. Many of these later works were collaborations with Leipzig's Collegium Musicum. Among them were the four volumes of the Clavier-Übung (“Keyboard Practice”), a large collection of works for organ and harpsichord that includes the Six Partitas (Vol. I), the Italian Concerto, the French Overture (Vol. II), and the Goldberg variations (Vol. IV). During this period, he completed the Mass in B Minor, which incorporated newly composed movements with parts of earlier works. In 1735, he presented the manuscript to the elector of Saxony in a successful bid to persuade the monarch to appoint him as royal court composer. Although the mass was never performed during the composer's lifetime, it is considered to be among the greatest choral works of all time. In 1747, Bach went to Frederick the Great's court in Potsdam, where the king played a theme for Bach and challenged him to improvise a fugue based on his theme. Bach improvised a three-part fugue on Frederick's pianoforte, then a novelty, and later presented the king with The Musical Offering which consists of fugues, canons and a trio based on the "royal theme," nominated by the monarch. Its six-part fugue includes a slightly altered subject more suitable for extensive elaboration. The Art of Fugue, was written months before his death, but was left unfinished. It consists of 18 complex fugues and canons based on a simple theme. A magnum opus of thematic transformation and contrapuntal devices, this work is often cited as the summation of polyphonic techniques. The final work Bach completed was a chorale prelude for organ, dictated to his son-in-law, Johann Christoph Altnikol from his deathbed. It is entitled Vor deinen Thron tret ich hiermit (“Before thy throne I now appear”). When the notes of the final cadence are counted and mapped onto the Roman alphabet, the word "BACH" is found. The chorale is often played after the unfinished 14th fugue to conclude performances of The Art of Fugue. Bach spent his last days in Leipzig and died there in 1750, at the age of 65. During his life he had composed over one thousand works. Bach’s inventive and unique melodies combine the finest of Italian, French and German styles while remaining full and contrapuntal; however, his melodies often imply emotion rather than convey it—something that many people today have trouble understanding. Bach’s counterpoint is among the most careful and precise ever conceived; the complexity of it is captivating to composers and non-composers alike, and contains as many as five melodies all harmonizing with each other at once. This combination of original melodic style and masterful counterpoint forged a powerful influence on later composers. Several notable composers such as Mozart, Beethoven, Schumann and Mendelssohn increased their attention to harmony and wrote more complex works after being introduced to Bach. Nowadays, his styles and melodies are the basis for music ranging from hymns and religious music to pop and rock music. Many of Bach’s themes—particularly the theme from Toccata and Fugue in D minor—have been used in rock songs repeatedly and have received notable popularity. Although the works of Bach generally influence other composers, one would do well to remember that in Bach's era, greatness was decided by the ability to master a technique, not by inventiveness. His musical style reflects the customs and conventions of his day, and was affected by the works of Couperin and Domenico Scarlatti. Antonio Vivaldi also inspired Bach a great deal as can be seen by Bach's transcriptions of Vivaldi's violin concerti into harpsichord works. Bach's works are indexed with BWV numbers, an initialism for Bach Werke Verzeichnis (“Bach Works Catalogue”). The catalogue, published in 1950, was compiled by Wolfgang Schmieder and is organized thematically, rather than chronologically: BWV 1–224 are cantatas, BWV 225–248 the large-scale choral works, BWV 250–524 chorales and sacred songs, BWV 525–748 organ works, BWV 772–994 other keyboard works, BWV 995–1000 lute music, BWV 1001–1040 chamber music, BWV 1041–1071 orchestral music, and BWV 1072–1126 canons and fugues. In compiling the catalogue, Schmieder largely followed the Bach Gesellschaft Ausgabe, a comprehensive edition of the composer's works that was produced between 1850 and 1905. Bach was best known during his lifetime as an organist, organ consultant, and composer of organ works both in the traditional German free genres such as preludes, fantasias, and toccatas, and stricter forms such as chorale preludes and fugues. He established a reputation at a young age for his great creativity and ability to integrate aspects of several different national styles into his organ works. A decidedly North German influence was exerted by Georg Böhm, with whom Bach came in contact in Lüneburg, and Dietrich Buxtehude in Lübeck, whom the young organist visited in 1704 on an extended leave of absence from his job in Arnstadt. Around this time Bach also copied the works of numerous French and Italian composers in order to gain insights into their compositional languages, and later even arranged several violin concertos by Antonio Vivaldi and others for organ. His most productive period (1708–1714) saw not only the composition of several pairs of preludes and fugues and toccatas and fugues, but also the writing of the Orgelbüchlein ("Little Organ Book"), an unfinished collection of 49 short chorale preludes intended to demonstrate various compositional techniques that could be used in setting chorale tunes. After he left Weimar, Bach's output for organ fell off, although his most well-known works (the six trio sonatas, the Clavierübung III of 1739, and the "Great Eighteen" chorales, revised very late in his life) were all composed after this time. Bach was also extensively engaged later in his life in consulting on various organ projects, testing newly built organs, and dedicating organs in afternoon recitals. Bach wrote many works for the "clavier," usually understood to mean an unspecified keyboard. Although the piano ("Klavier" in German) was invented in Bach's lifetime, most scholars doubt he had one or intended any of his music for it. His keyboard works may have been intended for harpsichord or clavichord instead. The two-part inventions and three-part inventions (or "sinfonias") were probably intended for instructional purposes rather than concert use. He composed a set of English suites and a set of French suites which form complex and difficult music compositions based loosely on dance forms. He also wrote a number of other solo dances, suites, partitas, and the like. Among the best known of these is The Well-Tempered Clavier, a set of preludes and fugues in each of the twelve major and minor keys. The word "well-tempered" refers to the temperament in which the keyboard is tuned. Tuning systems before Bach's time were not flexible enough to allow compositions in all keys to be played without retuning. It is, however, uncertain what temperament he meant. Another famous work is The Goldberg Variations. While being somewhat cerebral, their emotional content and range is increasingly being appreciated. Bach wrote music for single instruments, duets, and other small ensembles. For unaccompanied solo violin he composed a set of six sonatas and partitas, and he also produced a similar set for cello and another for lute. He wrote trio sonatas, solo sonatas (accompanied by continuo) for the flute and for the viola da gamba, and a large number of canons and ricercare, mostly for unspecified instrumentation. The most significant examples of the latter are contained in The Art of Fugue and The Musical Offering. Bach's best-known orchestral works are the Brandenburg concertos, so named because he submitted them as a job audition for the Margrave of Brandenburg in 1721 (he did not get the job). These works are examples of the concerto grosso genre. Other surviving works in the concerto form include two violin concertos, a concerto for two violins (often referred to as Bach's "double" concerto), and concertos for one, two, three, and even four harpsichords. It is widely accepted that many of the harpsichord concertos were not original works but arrangements of now lost concertos for other instruments. A number of violin, oboe, and flute concertos have been reconstructed from these. In addition to concertos, Bach also wrote four orchestral suites, a series of stylized dances for orchestra. The work now known as the “Air on a G String” is an excerpt from Orchestral Suite No. 3. Bach performed a cantata every Sunday at the Thomaskirche, on a theme corresponding to the lectionary readings of the week. Although he performed cantatas by other composers, he also composed at least three entire sets of cantatas, one for each Sunday and holiday of the church year, at Leipzig, in addition to those composed at Mühlhausen and Weimar. In total, he wrote over three hundred cantatas, of which only 195 survive. His cantatas vary greatly in form and instrumentation. Some of them are for a solo singer; others are for single choruses; there are those for grand orchestras, and the remainder are for a few instruments. A very common format, however, includes a large opening chorus followed by one or more recitative-aria pairs for soloists (or duets), and a concluding chorale. The recitative is part of the corresponding Bible reading for the week and the aria is a contemporary reflection on it. The concluding chorale often also appears as a chorale prelude in a central movement, and occasionally as a cantus firmus in the opening chorus as well. The best known of these cantatas are Cantata No. 4 ("Christ lag in Todesbanden"), Cantata No. 80 ("Ein feste Burg"), Cantata No. 140 ("Wachet auf, ruft uns die Stimme") and Cantata No. 147 ("Herz und Mund und Tat und Leben"). In addition, Bach wrote a number of secular cantatas, usually for civic events such as weddings. The Coffee Cantata, concerning a girl whose father will not let her marry until she gives up her coffee addiction, is the best known of these. As part of Bach's regular church work, he copied and performed motets by many other composers (indeed, he usually began each Sunday service with one). These motets were mostly double-choir motets of the Venetian school, or more contemporary imitations of the style. Bach wrote several motets himself, and they are also mostly for double choir, though the largest of them, Jesu, meine Freude, is written for a single, five-voice choir. Exactly how many motets were composed by Bach is a matter of dispute. There are six undoubted motets by Bach, a couple of others of doubtful authorship, and some works classified in the BWV as cantatas but considered by some scholars to be motets. It is not certain for what occasion Bach wrote these works, but it is thought that most were for funerals. There are no instrumental parts for these motets (except Lobet den Herrn, which has a continuo part), but it was typical of performance practice of the time to double vocal works with instruments and accompany them with a continuo. Thus, this method is often followed for modern performances. Other performers perform these in the a cappella style. Bach's large choral-orchestral works include the famous St. Matthew Passion and St. John Passion, both written for Holy Week services at the Thomaskirche, the Christmas Oratorio (a set of six cantatas for use in the Liturgical season of Christmas), a Magnificat in two versions, one in D major for a substantial orchestra with trumpets and timpani, and one for a smaller orchestra in E-flat major, with extra movements interpolated among the movements of the Magnificat text. Bach's other large work, the Mass in B Minor, was assembled by Bach near the end of his life, mostly from pieces composed earlier (such as Cantata No. 191 and Cantata No. 12). It was never performed in Bach's lifetime, or even after his death until the nineteenth century. All these works, unlike the motets, have substantial solo parts as well as choruses. In Bach's time, musical ensembles were generally not as large as in later times, like that of Johannes Brahms. Few of his works were composed for more than a dozen musicians. This presents an option to present-day performers whether to adhere to authentic performance, or choose larger, modern orchestrations to which many of his works have been adopted. Some of his more important chamber music does not indicate preferred instruments, leaving more possibilities for individual arrangements. Highly influential interpreters of Bach include Glenn Gould and Edwin Fischer (piano), Wanda Landowska (harpsichord), Helmut Walcha and E. Power Biggs (organ), Pablo Casals and Yo-Yo Ma (cello), Nathan Milstein (violin), Karl Richter (chorus and orchestra), Nikolaus Harnoncourt and Gustav Leonhardt (cantatas, authentic performance), Joshua Rifkin and Andrew Parrott (choral works, one per part). Bach's music has inspired many composers to create music based on his themes, or transcribe his works for other instruments. He is the most arranged and transcribed classical composer. His complete works for harpsichord have been edited or transcribed by Ferruccio Busoni, and Franz Liszt wrote both a praeludium and fugue on the ‘BACH’ motif. Another familiar transcription is the Ave Maria by Charles Gounod, based on the first prelude of The Well-Tempered Clavier. Andres Segovia was famous for his playing arrangements of Bach works transcribed for acoustic guitar. Mozart arranged some of the fugues from The Well-Tempered Clavier for string trio, Arnold Schoenberg arranged for orchestra Bach's "St. Anne" organ prelude and fugue in E-flat major, and Anton Webern arranged for orchestra the ricercar from the "Musical Offering." There are arrangements of the "Art of Fugue" for orchestra, for brass quintet, and for saxophone quartet. In his later years and after his death, Bach's reputation as a composer declined. His works were regarded as old-fashioned compared to the emerging classical style. But, he was far from forgotten. He was remembered as a player and teacher (as well, of course, as composer), and as father of his children (most notably Carl Philipp Emanuel Bach). His best-appreciated compositions in this period were his keyboard works, in which field other composers continued to acknowledge his mastery. Mozart, Beethoven, and Chopin were among his most prominent admirers. On a visit to the Thomasschule in Leipzig, Mozart heard a performance of one of the motets (BWV 225) and exclaimed, "Now, here is something one can learn from!" When he was given the parts of the motets, "Mozart sat down, the parts all around him, held in both hands, on his knees, on the nearest chairs. Forgetting everything else, he did not stand up again until he had looked through all the music of Sebastian Bach." Beethoven was also a devotee, learning the Well-Tempered Clavier as a child and later calling Bach "Urvater der Harmonie" ("original father of harmony") and "nicht Bach, sondern Meer" ("not a stream but a sea," punning on the literal meaning of the composer's name). Chopin used to lock himself away before his concerts and play Bach's music. The revival in the composer's reputation among the wider public was prompted in part by Johann Nikolaus Forkel's 1802 biography, which was read by Beethoven among others. Johann Wolfgang von Goethe became acquainted with Bach's works relatively late in life, through a series of performances of keyboard and choral works at Bad Berka in 1814 and 1815. In a letter of 1827 he compared the experience of listening to Bach's music to "eternal harmony in dialogue with itself." 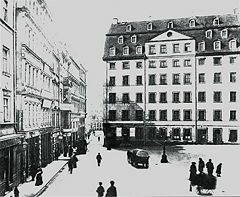 But it was Felix Mendelssohn who did the most to revive Bach's reputation with his 1829 Berlin performance of the St. Matthew Passion. Georg Wilhelm Friedrich Hegel, who attended the performance, later called Bach "grand, truly Protestant, robust and, so to speak, erudite genius which we have only recently learned again to appreciate at its full value." Mendelssohn's promotion of Bach, and the growth of the composer's stature, continued in subsequent years. The Bach Gesellschaft (Bach Society) was founded in 1850 to promote the composer's works, over the next half century publishing a comprehensive edition. Thereafter, Bach's reputation has remained consistently high. During the twentieth century the process of recognizing the musical as well as the pedagogic value of some of the works has continued, perhaps most notably in the promotion of the Cello Suites by Pablo Casals. Another development has been the growth of the authentic or period performance movement, which attempts to present the music as the composer intended it. Examples include the playing of keyboard works on the harpsichord rather than a modern grand piano, and the use of small choirs or single voices instead of the larger forces favored by nineteenth- and early twentieth-century performers. Bach's contributions to music, or, to borrow a term popularized by his student, Lorenz Christoph Mizler, his "musical science," are frequently compared to the "original geniuses" of William Shakespeare in English literature and Isaac Newton in physics. A significant repository of documentary evidence, including contemporary documents, some by Bach himself. This book includes an English translation of the biography of Bach, by the early nineteenth-century German musicologist Johann Nikolaus Forkel. Explores cognition, formal methods, logic and mathematics—particularly Gödel's incompleteness theorem—in the music of Bach, the art of M. C. Escher and other sources. Spitta, P. Johann Sebastian Bach, 1889. Forkel, Johann Nicolaus. On Johann Sebastian Bach's Life, Genius, and Works (1802). Translated by A. C. F. Kollmann (1820). Rasmussen, Michelle. "Bach, Mozart, and the 'Musical Midwife.'" The New Federalist (August 2001). Available online from the Schiller Institute. Retrieved August 28, 2007. History of "Johann Sebastian Bach"
This page was last modified on 11 May 2018, at 16:33.